Specialist lifting gantries, derricks and cranes. Temporary works relating to pile installations. Lift and transportation analysis and design for offshore modules. Temporary works associated with civil and earthworks. Temporary works associated with piling, precast deck & scour protection. 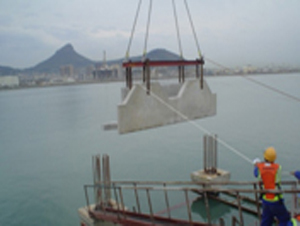 Works include design of pile support cranes and precast pile caps. 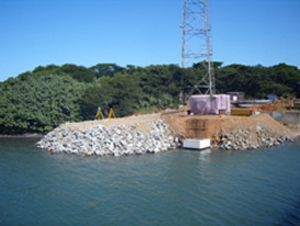 Temporary works include coffer dam design, earthworks design, berms and retaining structures. 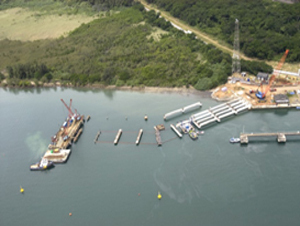 Temporary bracing of piles during construction of the new chemical berth. Analysis for 300 tonne truck support on rockfill embankment, during construction of the chemical berth. Structural assessment of the suspended deck for use of a mobile crane during construction of the chemical berth.